With Thanksgiving just right around the corner, I’m pretty sure that you’re now planning for some awesome decorations to dress up your home for this holiday. And that’s why I decided to look for some budget-friendly and easy to do Thanksgiving decorations you can do from the comfort of your home. Adding some Fall to your home doesn’t need to be difficult, expensive, and time-consuming. There are a lot of wonderful DIY projects that can make your home look great. So check them out below and let me know what you think! This paper bunting project is so easy to make and such a great addition to any room. It’s also a great decoration to remind us to be always thankful. Welcome your guests with this charming alternative Fall wreath. It’s so simple to do and all you need is an old tray and chalkboard paint. Pair your utensil holders with this personalized DIY project. It really looks adorable and perfect for your dinner table. Add warmth and charm to your home with this easy fall decoration idea. All it takes to make this pillow is a pillow cover from the dollar store and iron on vinyl. 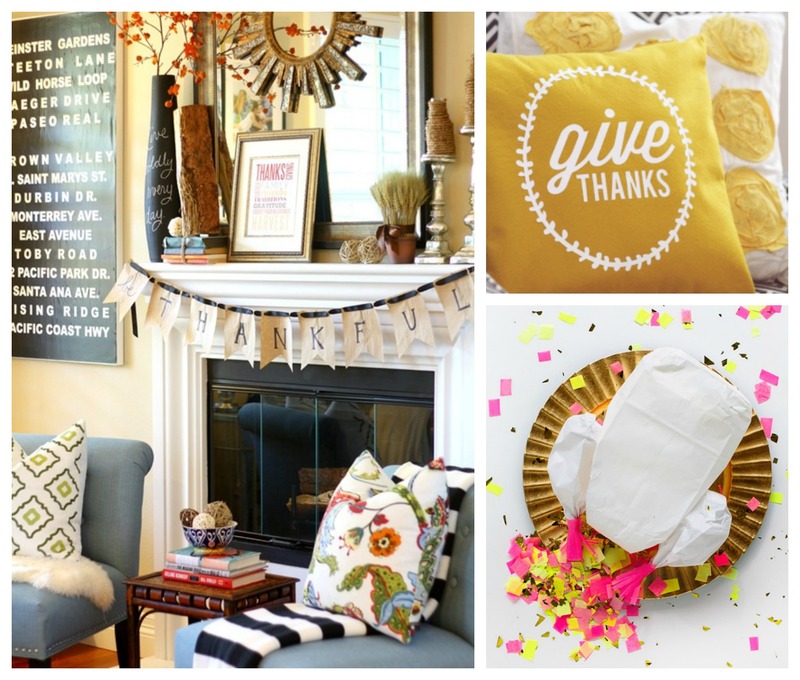 In a little time, you’ll have a cozy Thanksgiving throw pillow. Welcome the fall season with this DIY cinnamon candle. It’s easy to do and makes a great decorative fall centerpiece. This will definitely make your house smell amazing without taking much effort. The dollar store offer’s a lot of great paints but I highly recommend trying gold. Not only is it trendy, but it also gives a stylish, chic, and elegant look without spending much. Why spend so much on your table centerpiece when you can have a lovely one without splurging? This crafty idea for plastic pumpkins with a touch of gold spray paint is such a smart project. It really looks elegant and impressive. Having kids over on your Thanksgiving day feast? Surprise them with this cute and fun confetti stuffed turkey! Burlap ribbon from the Dollar Store makes this wheat bundle perfect for the Thanksgiving table. This really brings an Autumnal vibe without spending too much time and money. Alright alright, so this may not be things you can get from the Dollar Store, but it’s still a budget-friendly DIY project! And it’s super cute. So try out these “thankful for,” customizable place cards, at your next dinner party! It’s an easy way to impress your guests and it’s definitely budget-friendly. Whether you’re looking for a celebration door wreath or a table centerpiece for Thanksgiving Day, there’s always a plenty of amazing things that you can find at the Dollar Store. Not to mention, these ten tips from the list are seriously budget friendly and super easy to do, because who has time to decorate their house right? So give them a try and let me know what you think. Now if you have any questions about any of these DIY Thanksgiving projects, let me know in the comments down below! I’d love to hear about them!